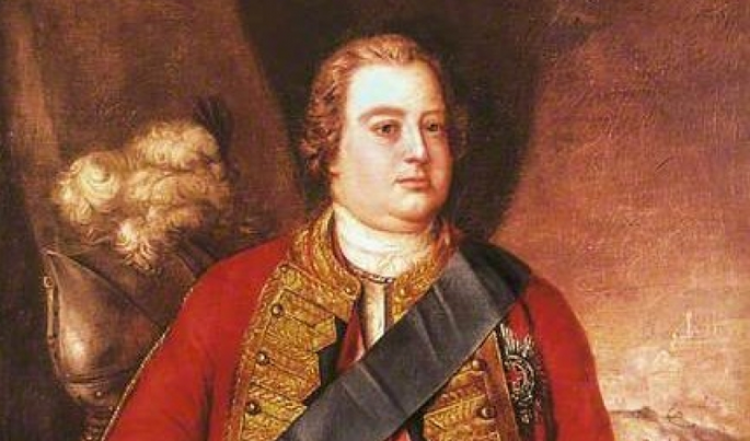 This year marks 250 years since the death of William Augustus, Duke of Cumberland. In August 1760 Cumberland suffered a stroke and five years later on 31st October 1765 Cumberland died aged 44 at Upper Grosvenor Street in London. Today, Cumberland is largely known by his nickname ‘Butcher Cumberland’, following the Battle of Culloden and the pacification of the Highlands, and he remains a controversial British military figure. In order to fight the Jacobite army, led by Prince Charles Edward Stuart, Cumberland was recalled from duty in Flanders where he had been fighting in the War of Austrian Succession. His move back to England to the head of the British Army for a popular appointment and caused morale to lift amongst the government troops. 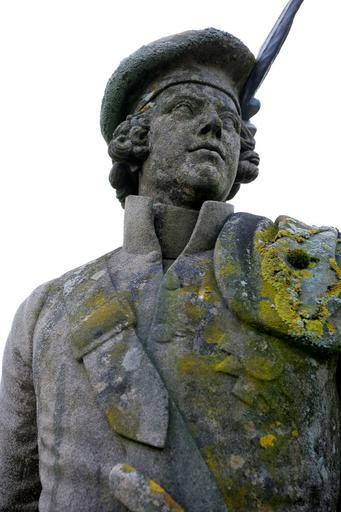 He is credited with training the government men to stand fast against the Highland charge and to hold their firing until the Jacobites were within good range to inflict maximum damage. This training would help the Government army when they came to meet the Jacobites at Culloden. The day before the battle, 15th April 1746, a copy of the general orders issued to the Jacobites was stolen, and someone, presumably on Cumberland’s instruction, inserted a forged addition, to the effect that no quarter was to be given to any Government prisoners. The Jacobites were to be portrayed as ruthless men unwilling to let ay Government men escape the battlefield alive. On the morning of the battle Cumberland’s troops were circulated with an order that said: ‘Officers and men will take notice that the public orders of the rebels yesterday was to give us no quarter.’ Cmberlands response was to in turn order his men to give no quarter to the Jacobite men and after the battle had been won his men marched across the battlefield bayoneting any man lying dying or wounded. Following Culloden Cumberland then began the process of the pacification of the Highlands. All men believed to be ‘rebels’ were killed, as were non-combatants; ‘rebellious’ settlements were burned and livestock was confiscated on a large scale. Over a hundred Jacobites were hanged and many men and women were imprisoned and often sent by ship to London for trial. The journey south could take up to 8 months and many of prisoners died in the ships before they reached their destination. Cumberland was known as displaying the strictest discipline in his camp. He was inflexible in the execution of what he deemed to be his duty, without favour to any man. In only a few cases did he exercise his influence in favour of clemency. In the months that followed there appeared to be two very different opinions of Cumberland. Some christened him ‘Butcher Cumberland’ for the atrocities he was enacting on the Highlands whilst other nicknamed him ‘Sweet William’ and celebrated his success at defeating the Jacobite army. Cumberland was given the freedom of the City of Glasgow and made Chancellor of both Aberdeen and St Andrews Universities. In London a thanksgiving service was held at St Pauls Cathedral, which included the first performance of a new oratorio by Handel ‘Judas Maccabaeus’ which was composed especially for Cumberland and which contains the anthem ‘See the Conquering Hero Comes’. However, the brutality of the aftermath of Culloden slowly began to take the shine off Cumberlands image and the taunts of ‘Butcher’ certainly did not help. His image further sank when he was defeated in the Seven Years War. Cumberlands men were vastly outnumbered and he was forced to retreat. On return to Britain he was publicly reprimanded by King George II and consequently resigned all his military and public offices and retired into private life. Retiring to Cumberland Lodge in Windsor, Cumberland largely avoided public life and died both unmarried and childless. Following his death he was buried beneath the floor in the Henry VII Lady Chapel of Westminster Abbey. The Duke of Cumberland is a figure of much controversy but hopefully this post gives you a bit of an insight into the actions that led to his ‘Butcher’ moniker. As always please share, comment, tweet, ask questions and be inspired to learn more about the true history of the Jacobites. In the National Trust for Scotland we are lucky enough to have several sites which are connected to the Jacobite story so we thought we’d look at a few of these special places and share their unique stories. Firstly, to the majesty of Killiecrankie. This steep sided gorge was home to the Battle of Killiecrankie in 1689 in which the Government army was sent north to deal with Viscount Dundees newly formed Jacobite army. The Jacobites were able to rout the Government army, but it came at a cost. Roughly one third of the Highland force was killed and Viscount Dundee was mortally wounded. He died on the battlefield and was carried the few miles to the nearby parish church of St Bride, above Blair Castle where he was buried. The death of Dundee, in the midst of the confusion of a cavalry charge, became the subject of numerous legends, the best known of which was the tale that he was invulnerable to lead (due to having made a pact with the Devil) and was killed not by the government shot but by a silver button from his own coat being pushed into the wound. 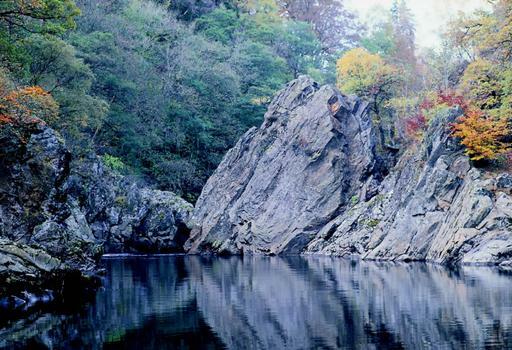 Another legend of Killiecrankie is the Soldiers Leap. Along the gorge is a narrow section where it is said Donald MacBean, a government soldier, avoided capture by jumping 5.5m (18.5 feet) across the river. Despite losing his shoe on the way across, he survived and escaped, later becoming a prize fighter. You can walk out to the point at which MacBean made his famous leap but i wouldn’t fancy giving it a go myself. 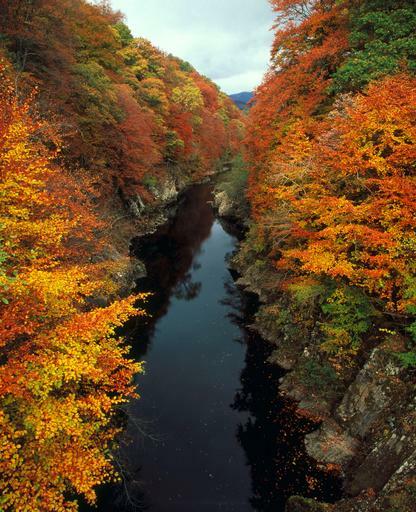 Today the gorge is famous for its autumn colours. Its Gaelic name ‘Coille Chneagaidh’ or ‘Wood of Shimmering Aspen’ sums it up perfectly. There is a beautiful walk along the gorge or for the more adventurous there is a bungee jump off the Garry Bridge. From gorgeous Killiecrankie to the equally stunning Glencoe. This beautiful site is considered one of the most picturesque spots in Scotland but its history is a little more on the ugly side. 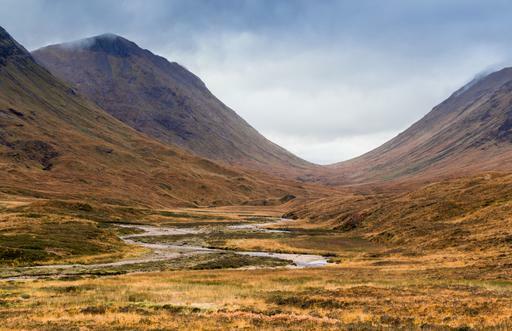 In 1692 the Massacre of Glencoe took place in the early morning of the 13th February. Members of the MacDonald clan were murdered by soldiers of the neighbouring Campbell clan for not pledging allegiance to William III. The Highland clan chiefs had been set a deadline of the 1st January 1692 to swear an oath of loyalty to William III to be granted an indemnity. MacDonald was late in declaring his oath and an order, signed by the King himself, was raised to enact the massacre. Alastair MacLain, 12th Chief of Glencoe, and the man responsible for the late pledge, was killed as he tried to rise from his bed. 37 other men were murdered in their homes or as they tried to flee with as many as 40 women and children dying from exposure after their homes were burned down. Today there is a monument in Glencoe remembering the fallen MacDonald men. 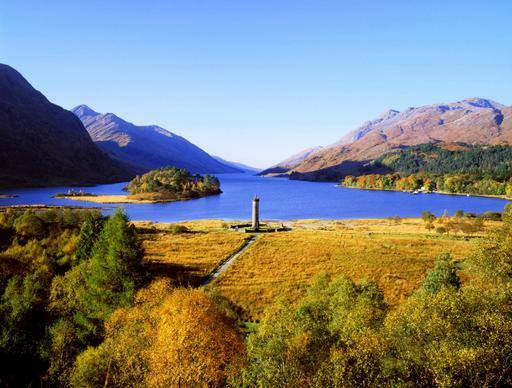 Finally we couldn’t talk about Jacobites without mentioning Glenfinnan Monument. It was here that Prince Charles Edward Stuart truly began his ’45 campaign on 19th August 1745. On the hills around the monument Charles raised the Jacobite standard for the first time and began his fateful campaign which would end the following year at Culloden. All the mustered clans heard as Charles claimed the Scottish and the English thrones in the name of his father, James, the Old Pretender. In 1815 a monument was built to commemorate the raising of the standard, the monument stands 18m high and is topped with a statue of an unknown highlander. Be sure to check out these places and even more to discover the history of the Jacobites and of course make sure you visit Culloden to complete your visit! As always please like, share, tweet, follow, comment and enjoy uncovering the pages of history as you take your own Jacobite adventure. 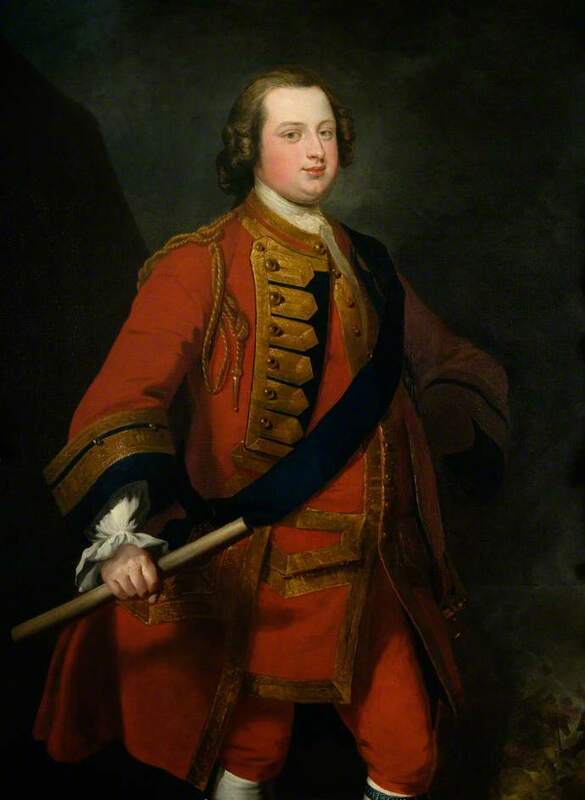 Most of history remembers Bonnie Prince Charlie and his romanticised attempt to take back the Stuart throne for his father, but little is mentioned about his brother, Henry Benedict Stuart, who was the final public Jacobite heir to the Stuart throne. Today we take a closer look at Henry and discover more about his history…. Firstly his name was not simply Henry Benedict Stuart, it was in fact Henry Benedict Thomas Edward Maria Clement Francis Xavier Stuart, but that’s a little long to keep saying so for now we’ll make do with Henry. Henry was born on 6th March 1725 in Palazo Muti in Rome and was baptised by Pope Benedict XIII on the same day. From birth he was known as the Duke of York and he was apparently a rather intelligent child who could spell and write better than his older brother Charles. In 1745 Henry travelled to France to help gain French support for Charles expedition and was there when Charles escaped in 1746 to greet him when he returned to France. By all accounts Henry appears to have been more introverted than Charles and more cautious in his approach to problems. However, he did manage to secure French troops and ships to support the ’45 but ongoing delays meant they never reached Scotland in time to aid his brother. Consequently many Jacobites felt he had not done enough to support the Jacobite cause and his lack of aid was a source of friction between the brothers. The brothers relationship became more strained when, on return to Rome, Henry persued his desires to become a Cardinal in the Catholic Church. Charles has tried not to emphasise his familys Catholicism, fearing it would prevent the Protestants in Britain from joining his cause, and therefore he was not particularly pleased with Henrys descision to join the church. Henry was ordained as a Cardinal Deacon on 30th June, 1747 and was very committed in his duties becoming Cardinal of Santa Maria, Portici, on 3rd July, 1747, before being ordained as a priest on 1st September, 1748. Henrys father James, the Old Pretender, fully supported his sons desire to become a priest but personal relationships began to come between the father and son. Henry became very close with his majordomo, Giovanni Lercari, and this led to serious family tension eventually resutling in Henrys father attempting to have Lercari dismissed from service. Henry responded by attempting to seperate his finances from his father and a public scandal was only avoided by the input of Pope Benedict XIV who acted as a peace maker. Whilst some suggest there was more to the relationship than meets the eye nothing was ever proven and many have pointed to Henrys strict views against all impropriety to refute any allegations. Henry and Charles would also reconcile with the help of Charles daughter Charlotte and it was Henry who to to convince Charles to stop drinking and offered him financial support in his later years. On the death of Prince Charles, Henry became the Jacobite claimant to the throne and apparently declared himself Henry IX but did not take any action to persue his claims. For most of the next forty years Henry lived in the town of Frascati just south of Rome where he was known as a very active bishop who led a simple life and is remembered for his acts for charity. 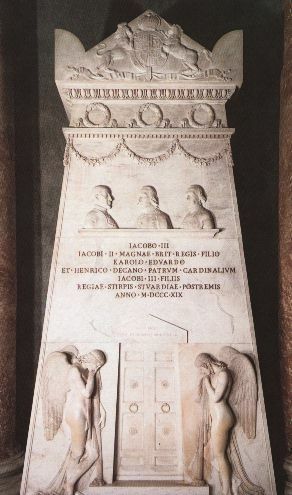 When Henry died in 1807 he was buried along with his brother, father and mother in the crypt of St Peters Basilica in Rome. He was succeeded in all his claimed British rights by his nearest blood-relative and friend, Charles Emmanuel IV of Sardinia. Charles was the great-grandson of Henrietta Anne, the youngest daughter of Charles I but neither asserted nor renounced his Jacobite claims, nor have any of his successors to this day. Henry certainly followed a different path to his brother Charles and is largely remembered for his work in the Catholic Church eventually becoming Dean of the College of Cardinals in Rome and Cardinal Bishop of Ostia and Velletri. Hopefully this little insight has piqued your curiosity about the often forgotten Henry Stuart and as always please like, follow, share, comment, tweet, reblog and keep coming back for more intriguing stories. 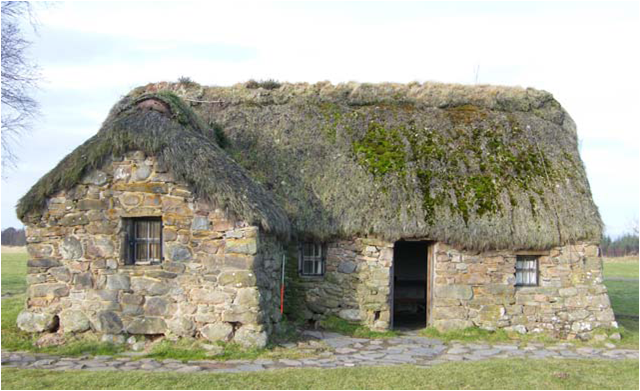 Situated on the grounds of Culloden Battlefield lies Leanach cottage. 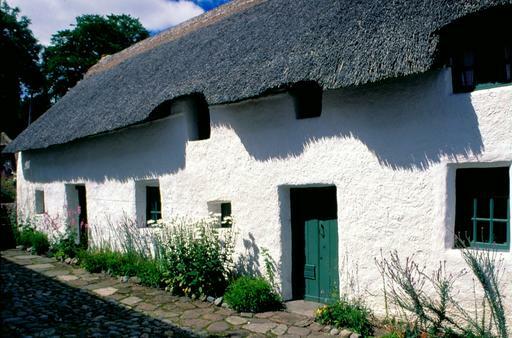 This beautiful thatched cottage attracts many visitors throughout the year and is a lovely memory of the history of the battlefield. Today, we thought we’d share a little more about the cottage and why it is so special to all of us here at Culloden. Leanach is one of the last survivors of a once common local structure type of a single storey thatched building. Today the building stands as an isolated structure but in the past this area was well populated and the land divided into smallholdings. Historical maps show a number of farmsteads in the close vicinity with small pockets of individually cultivated land, however, Leanach is now one of the only surviving examples of this landscape. 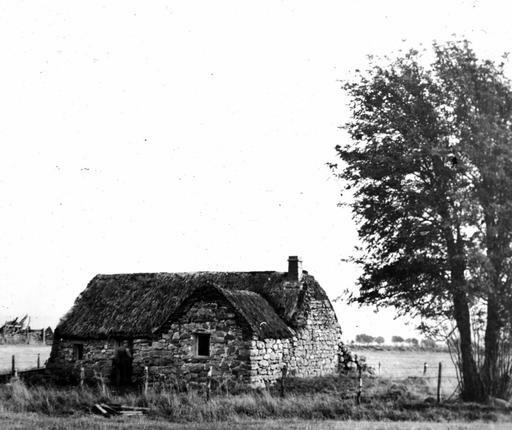 The cottage itself was likely constructed in the early 18th century, probably as part of wider improvements on Culloden estate and originally would have been a T-shaped structure. In the 17th and 18th century estate owners provided their tenants with the wood for their roof crucks whilst the tenant was responsible for the construction of the walls of their houses.The walls were often made from local stone and/or turf at the gable ends. 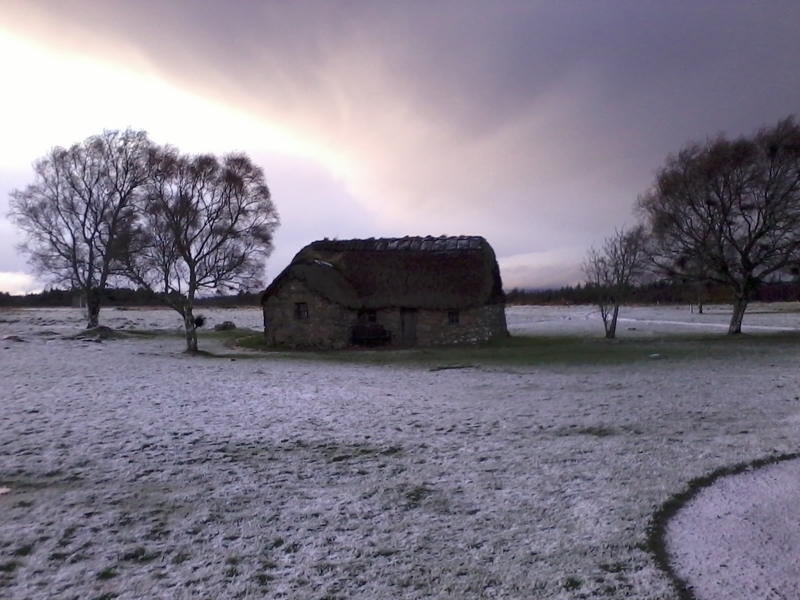 During the Battle of Culloden Leanach Cottage was situated in between the Government lines and it is likely the building would have been used as a field hospital for the government men. Following Culloden there were several periods of occupation, sometimes intermittent and the shape of the building appears to have been altered by the demolition of the western end of the structure in the mid-late 1860s, leaving an L-plan structure which can still be seen today. The building then appears to have been abandoned again shortly after this and fell into a ruinous state (late 1860s-1880s). 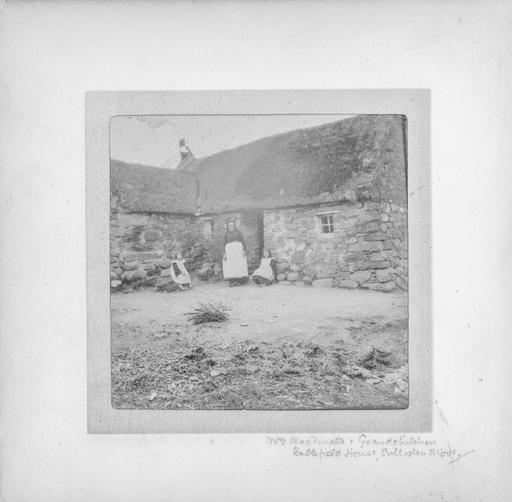 The cottage was then rebuilt and reoccupied in the early 1880s, possibly as part of Duncan Forbes’ work to memorialise the Battle of Culloden during which time he also built the memorial cairn and erected grave stones on the clan graves. The last occupant of Leanach Cottage was Belle MacDonald who lived here until she died in 1912. Her family apparently gave tours of the battlefield to interested visitors as the Victorian railway brought tourists into the highlands. 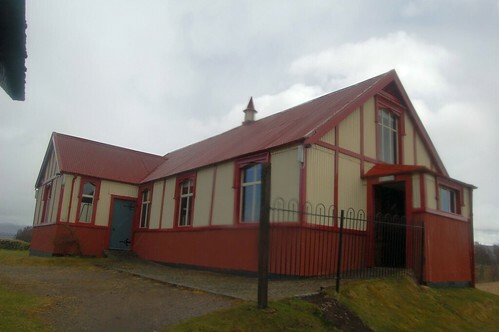 In 1924 the Gaelic Society of Inverness and Thomas Munro Architects set out to repair and conserve the building and the original steeply pitched roof was replaced with a shallower one. The National Trust for Scotland was gifted Leanach Cottage in 1944 by Hector Forbes, the local land owner, and it became the original visitor centre in 1961. Quite different from the centre we have today it had a few simple panels to allow people to experience the story of the battle. Minor alterations continued until 1978 when the NTS removed the old 1920’s roof and replaced it back to a steeply pitched roof more in line with the original crucks which were still visible in the western wall. With the opening of the new visitor centres Leanach has been able to retain its charm and beauty and we hope to be able to open the cottage once again next year so visitors can see inside this lovely piece of history. In terms of conservation of the thatch and the turf wall, it is easy to see why the Trust needs the support of its Members to keep such buildings from falling into disrepair. Now, we don’t usually play the charity card but this time we are so please forgive us. If you would like to help protect Leanach Cottage you can go to https://www.nts.org.uk/Donation/Appeal/Once/Give-to-your-favourite-National-Trust-for-Scotland-place/ or you can text ROOF75£5 to 70070 to donate £5. Thank you. Hope you enjoyed the post. As always please like, follow, share, tweet, comment and keep coming back for more!